Unattended upgrades will (obviously) upgrade your Debian-based system unattendenly. If we keep it simple, this is basically an automated apt-get upgrade with some tweaks. That’s it – that’s unattended upgrades! I’m more the let’s-do-it-unattended-guy, because IMHO this is the much better option than the rest. I’ve also my issues with the reasons I’ve heard for the cons. So we’ve option A, which means we wait for your lovely patch window – which means our systems are vulnerable until that point – which means we can get hacked – which means that can harm the company – which means, of course, someone’s responsible for that little accident – which means you might think about it when you’re going to sleep. Then we’ve option B, which means we do it automatically – which means our systems are always up-to-date – which means they’re secure – which means everybody’s happy – which means you can go to sleep with a clear conscience. Just to be clear here, IMHO option A (in general) is the retarded option and only makes sense in some exceptions. You should definitly aim for option B. Of course, not every environment is as black & white as described here. I just tried to keep it a bit witty. Still, you should try to avoid humans and do it automatically. Regardless of your decision, there might always be some exceptions. But that doesn’t mean you can’t do unattended upgrades for the majority of servers, services or packages. Debian already has a nice documentation about unattended upgrades. The documentation is nice and I used it to get it up & running. However, this is just for the basic setup and I had to figure out the deets by myself. This basically says do an apt-get update and apt-get upgrade every day, thus the number 1 (n-days) as value. This is the file used to configure listchanges, which keeps track of changes. Just make sure your mail config is working and the email address is defined correctly. unattended-ugprades is running automatically and is called via cronjob. You don’t need to install apticron or alike, as mentioned in several other posts. For our infrastructure, we’re installing and configuring unattended-upgrades automatically via Ansible on every server. Here’s our default configuration with comments. // !!! WARNING: This file is managed by Ansible, DON'T EDIT it manually !!! // Do "apt-get upgrade" every n-days (0=disable). // Do "apt-get upgrade --download-only" every n-days (0=disable). // Do "apt-get autoclean" every n-days (0=disable). // Automatically run "dpkg --force-confold --configure -a". // Do automatic removal of new unused dependencies after the upgrade. // Install upgrades when the machine is shuting down instead of doing it in the background. // Automatically reboot if the file /var/run/reboot-required is found after the upgrade. // If automatic reboot is enabled and needed, reboot at the specific time. // Enable logging via syslog. As you can see, we automatically install security-related updates every day in the background. This ensures our systems get the most important security patches. For the update of every other package, we use an Ansible playbook which simply does a dist-upgrade with a bit of exception handling, followed by running all configuration playbooks again with a final reboot. We do not automatically reboot our systems, because we don’t want them to go completely down in the middle of the day. Of course you can schedule it by defining the reboot time (other than now), but our approach is a bit different. 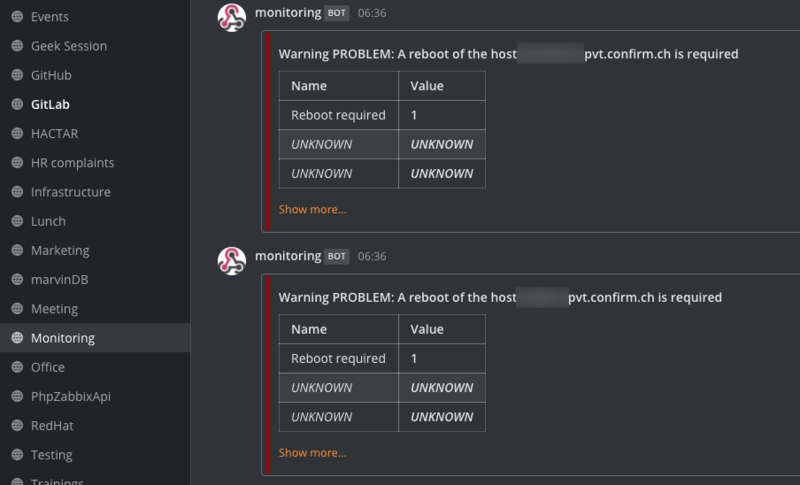 Combining unattended security upgrades with automated attended full system upgrades is IMHO a nice way to keep your environment up-to-date and secure, without losing control of critical upgrades where a systems engineer is required. Hi, seeing your config file reminds me of Debops. So, do you use Debops to admin your infrastructure ?